Gorilla Glass 4 is an amazing material. It is resistant to cracking and scratching, all while maintaining excellent optical qualities. But if pushed too far, even Gorilla Glass 4 may break. Unless it is protected by a case, that is. The gorgeous Samsung Galaxy S6 and Galaxy S6 edge are on display here at Mobile World Congress along with a range of cases made to protect Samsung's new high-end phones. These cases range from stylish flip covers, which protect both the front and the back of the handset, to designer shells covered in Swarovski crystals, to light and rigid transparent cases that protect without obscuring the phone's attractive design. While we had the chance, we took a few snaps of these cases for the Samsung Galaxy S6 and S6 edge. 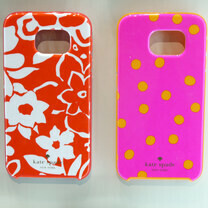 Note that the range includes both official Samsung cases and ones made by third-party partners including Kate Spade, Burton, and Rebecca Minkoff. Check them out in the gallery below! Are the cases going to fit both the S6 and the S6 Edge? What's the point of buying a luxury device with amazing aesthetics if you're just going to put a case on it that ruins all the work put into the device? Naked phones for life. BURTON CASES :D YEEEEEEEAAAAAAAAAAH. I want an S6. i will probably get the clear view case by samsung. it's a case that shines through the case to show notifications and stuff.